Route outbound calls to gateways, tdm, enum and more. When a call matches the conditions the call to outbound routes. Check out the youtube video . 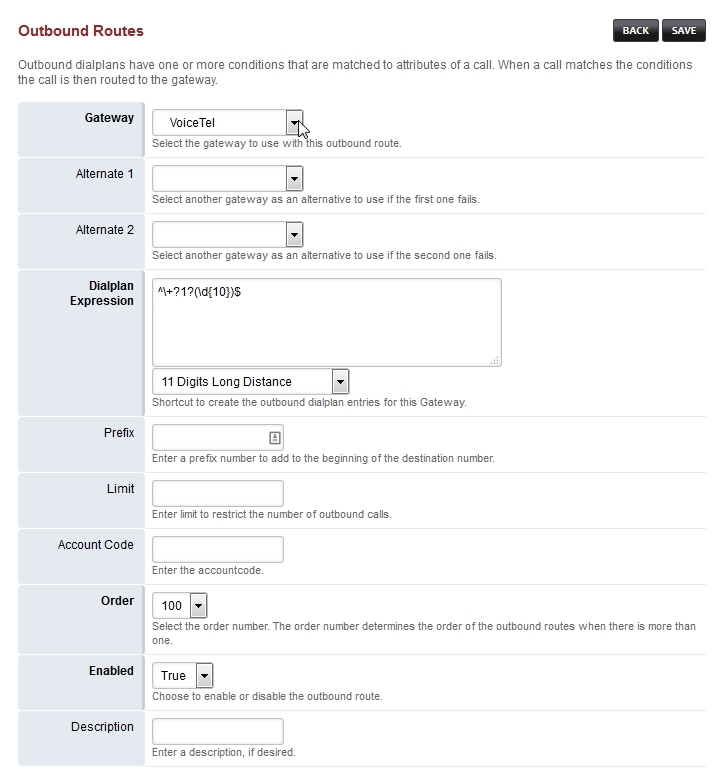 Select Dialplan from the drop-down list and then click Outbound Routes . Click the plus button on the right. Enter the route information below and Click Save once entry is complete. By using VoiceTel you help support FusionPBX. Thank you for your support! To have the system ask for a PIN number before a call is made. A good use is if you don’t want every user on the system to be able to call international destinations. This can be done with a single PIN or multiple PINs by using the “PIN Number APP”. First enable access to the “PIN Number” app by giving permissions to the group of users you want to have access in Advanced > Group Manager. Make sure the “PIN Number” App is displayed in the menu by selecting the groups that can view it in Advanced > Menu Manager. If you want to know the gateway your call is using there is currently no way to do this with FusionPBX’s GUI. Instead you can do it this way. show channels as xml and then press the execute button. In the output that is returned, look for the string sofia/gateway/ and the gateway name. This is the gateway your call is using.